"Theo: God's Grace" is the second DVD in the Christian animated series that highlights spiritual topics in a way that kids (and adults!) can better understand them. 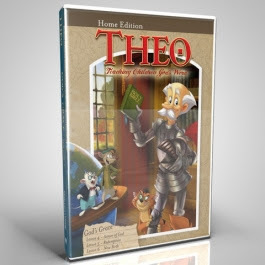 The series has a Grandfatherly narrator, named Theo, who loves to sing hymns and tells stories from the Bible. Two mice, Luther and Belfry, provide the comic relief. The quality animation and character voice-over work are very impressive. Themes covered in "Theo: God's Grace" include: the armor of God, redemption, and new birth. The armor of God episode shows how Paul wrote these verses while he was a prisoner in Rome. Seeing the context of the verses makes it so much more interesting. The episode on redemption touches on slavery and discusses how God has paid the price for us. The new birth episode discusses what spiritual death is and tells the story of Nicodemus meeting Jesus at night. Each episode is approximately 10 minutes. Ideally, watching an episode will encourage deeper heart to heart conversations with your child/children. My one concern with "Theo: God's Grace" DVD is when Luther states: "We better shove off before we get the belt of truth". I didn't find it funny and suspect that many kids won't 'get' a joke about spankings. A word of warning for those with sensitive kids, some might be scared by the cat who (spoiler alert) catches and tries to eat Luther and Belfry. My sensitive kids were fine with it, but 'scary' varies person to person. My kids loved watching the bonus feature "From Pencil to Pixel" which shows behind the scenes animation techniques. "Theo's Fireplace" was also a great bonus feature. How neat to feel like a cartoon character sitting in front of a cartoon fireplace! I would recommend Theo: God's Grace DVD for anyone who wants to introduce or reinforce key aspects of the Christian faith (all while having a lighthearted laugh). This DVD is great for the whole family! Check out: Fish Flix for all of the Theo DVDs as well as other Christian Movies "to inspire and entertain"! As a special offer you can get a $5 coupon to Fish Flix if you join their e-mail list. This looks like a cute series. I have never heard of it before. Thanks for sharing. kristiedonelson(at)gmail(dot)com Thank you.